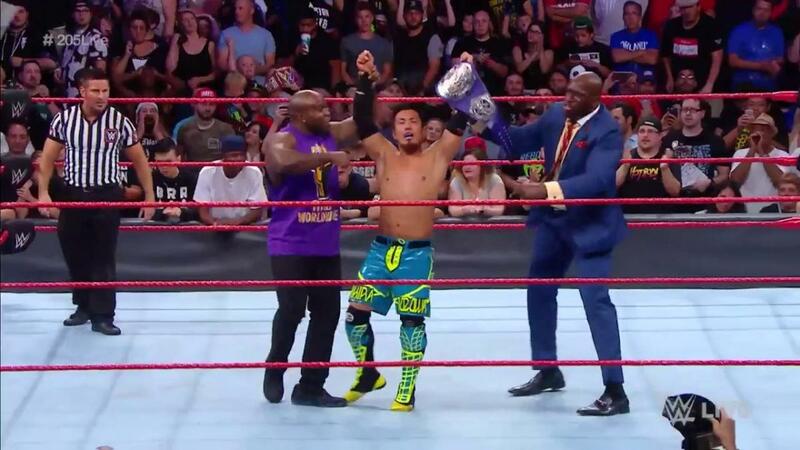 There's a lot of tea leaf reading to be done about the decision to move this match from Summerslam to Raw, and then have the rematch at Summerslam with Tozawa as champ. On one hand, it's a demotion, but on the other hand, would it have gotten lost in the shuffle, but on the third hand, Brooklyn smarks might have loved it. It was an OK match, but I'm still not sold on Titus Worldwide being a group of faces. The celebration on 205 died several deaths as Titus tried to keep the crowd engaged until Neville's interruption. I haven't been super into the will they won't they romcom that is Seth Rollins and Dean Ambrose getting back together, but the reunion this week worked for me because it was so hilariously dewy-eyed and melodramatic. Plus, a hot Boston crowd helped. Weird that they still do their fist bump at like a 60 degree angle as if to leave room for Roman Reigns even though that's never gonna happen. I can see this two ways. First, getting away from the MitB briefcase being a sure thing is probably a good idea, so having guys screw up their cash-ins every once in a while is fine. But given that history, it's hard not to see what happened on Smackown as a demotion for Corbin. Which is fine by me. Never been the biggest Corbin fan, although he's certainly progressed to "acceptgable" since his callup. We all knew that was going to be the call, but her match defeating Nia Jax for the spot was fantastic. Finn Balor lost clean to Bray Wyatt, then had a bucket of fake blood that the announce3rs refused to call blood poured over him in what was, admittedly, the best spooky stunt Wyatt's pulled in over a year. Unfortunately, WWE's need to tell, not show, led to first, Balor talking backstage about he has demons, then the announcers wondering if that means what they think it means, and then a full on promo card showing Balor in Demon mode. Way to ruin a good thing, WWE. Big Show's Hand Is "Broken"
Anderson and Gallows, in pure Nothing Better To Do mode (see, als, Hardys tagging with Jason JOrdan), helped Big Cass break Big Show's hand before their Summerslam match. Not sure what this means for the outcome.